The music industry is littered with slim chances and near misses. Life savings spent on hopeful demos, delivered in well-designed or at least well-intentioned packages to the desks of highly critical record executives. Yet no matter how "by the book" an artist's resume might seem, it still takes a special hand behind the scenes to create an open door - and courage to walk through that door into all that lies ahead. That's what it took for 22-year old singer/songwriter Ben Glover to realize his lifelong dream. "I've known since I was eight or nine years old that I wanted to be in Christian music," explains Glover, a Loveland, Colorado, native. "I didn't know what 'ministry' was when I was eight, but I knew I wanted to play Christian music because I loved God. I never really second-guessed myself - I just knew that's what I was going to do with my life." It took some time for Ben to find his own voice, however. "I became a Christian when I was five," he reflects, "but growing up, I never really went through a 'rebellious' phase. Then about three years ago, my dad and I were talking, and he said I needed to pray that God would show me the true condition of my heart. 'When you see how deep your sin runs,' he said, 'only then can you be truly thankful for the redemptive power of the cross.' It was not long after that, when I was down with the flu for about a week and had time to reflect on things, that God really showed me the depth of my own self-righteousness. It finally became real to me that it wasn't my 'goodness' that saved me - I really am so messed up, and Jesus truly is my only hope. So if there's a common thread to these songs, it's talking about the redemptive power of God's grace." 26 Letters, Ben's Word Records debut, showcases his love of intelligent pop music phrasing and his well-developed gift for writing mature, incisive lyrics. The infectious title song kicks off the album - a guitar-driven pop cut that sports clever wordplay, courtesy of co-writing assistance from Wayne Kirkpatrick. "A GRAMMY-winning co-writer on my first song-not a bad start, eh?' Ben laughs. "Actually, I have to credit my fiance with the inspiration for the song," he explains. "She's very articulate, but she wrote me a note where she said she felt restricted by only having 26 letters to express her feelings. I thought, 'What a great idea for a song!' The Lord has done so much for us, and yet we have only a few letters to make all the sentences and paragraphs that express our gratitude and praise." Another example of Ben's strength as a perceptive lyricist soon follows, found in the counter-punch of "Stolen By Mercy." "Human frailty is common to everyone, whether you're a Christian or not," says Ben. "We live in a world where we're taught to be independent and self-sufficient - you can't ever admit to being in need. That's why people have such a hard time with Christianity. It teaches you to be dependent on something you can't see. 'Stolen By Mercy' is probably my favorite song on the album, because I think it best reveals my heart. The power of God is so vast that sometimes we are just overtaken by it; His mercy and redemption are so strong that He literally steals our sin from us." "Welcome to America" provides the album's heaviest lyrical punch, calling for an unwaveringly honest self-appraisal. "This is a great country we live in," says Ben, "yet in the last five or ten years, we've gone on this kick of tolerance and blame shifting-it's always somebody else's fault. Tolerating sin is basically what the world would have us do. Our previous president exhibited a complete lack of moral character - yet we say 'he's a good president' and we excuse it. We're building a generation where ethics and integrity are secondary. People are becoming cold towards the Lord, and I believe we're setting ourselves up for spiritual bankruptcy; so this song is a prayer pleading, 'God, heal us.'" On a gentler note are two ballads that Ben wrote for his father, whom Ben credits as his life inspiration. "My dad has been in Christian ministry for over 25 years, and for most of that time, he was also dealing with the pressure of coaching gymnastics in the public school system," explains Ben. "Not too long ago, he came to a point where he just hit a rut and became very discouraged. I tried to imagine what that must feel like, and wrote 'Hope Will Be My Song' in his voice, as his prayer for God's mercy and encouragement. "Another song, 'The Man I Want To Be,' started out as a gift for my dad - he retired from coaching mainly because our church asked him to take over as pastor. I wrote the song with no thought that anyone other than my dad and the people at his retirement party would ever hear it. It talks about events that really happened to us while we were driving cross-country from Colorado to Nashville. One day I played it for the guys at Word, and they said it had to go on the album." Ben says that sort of encouragement is what has kept him focused on this career path since childhood. "I started with piano lessons when I was seven. I think my parents were trying to find some avenue of expression for me to gain confidence. Fortunately, I had a teacher who was very gracious and gave me the freedom to experiment and enjoy playing." By the time he reached his sophomore year of high school, Ben parlayed that enjoyment into a fascination with songwriting ("mostly cheesy instrumentals," he laughs) and developed an aptitude for other instruments as well. "I was a total 'band geek,'" Ben admits. "I played piano in the jazz band, then trumpet and French horn in the marching band." 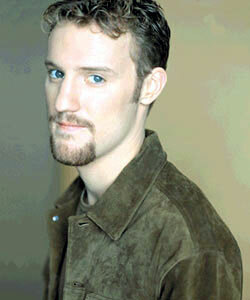 Ben came to Nashville in January 2000, determined to showcase his talents in a live setting and make the rounds of record labels with his independent CD as a calling card. Upon his arrival, he recalls, "I found out my engine was about to blow a rod. It was an expensive repair, and it meant that I had to stay in town two weeks, rather than a few days, waiting for my engine to be rebuilt. Because of that, I was able to meet several times with Brad O'Donnell (director of A&R, Word Records), and also to meet Chaz Corzine, who's now my manager (of Blanton, Harrell, Cooke & Corzine Management, home also to Amy Grant and Michael W. Smith). We developed a great connection - they liked the music a lot, and believed in me. Brad brought me back a month later to do three demos; and not long after that, Word offered me a deal, and Chaz signed me to a management contract." Though poised and mature for an artist just barely in his 20's, Ben says he recognizes the fact that there is a tremendous amount of pressure being put on younger artists today, not only growing up in the spotlight but also acting as a role model for their peers. "It honestly scares me to death," he admits, "only because I know how much pressure there is on anybody who's up front to be almost perfect. People look to the ones on stage as the people who have it all figured out. They have the answers because they're singing about it, and they sound so confident. You know what? I don't have all the answers - I'm as fallible and frail as anyone, and that's what I'm singing about. My hope is to express that. I want to be a role model, but I don't want to be a hypocrite, and that's a lot to bite off. I understand what the apostle Paul meant when he said 'I do the things I don't want to do, and the things I want to do, I don't do.' I have the same problems and struggles as anyone - I'm just singing about the fact that I don't have it all figured out." Although few artists get to make records and fewer still sustain lengthy careers, Ben says he's prepared to see to fruition that which has been his life-long ambition. "I've always lived for the 'when' - I think most men are like that - 'when I get this job,' or 'when I get married' and now, 'when I sell records.' I've learned more recently to focus on the 'now.' I'm so young and so new at this. There're going to be days when I really don't feel like getting out of bed. Whenever it gets tiring, if I know what I've done has made a difference in one life, then I'll be ready to get up the next day and do it again. "I think we've made an album that can be enjoyed musically, and my hope is that it will help people deepen their walk with the Lord. I want it to make you think. I hope the album challenges people and even scares a few people, but not for any other purpose than to draw them closer to the Lord-to be so honest and straightforward with the Gospel and issues of faith that you can't help but ask another, deeper question. If this album does that, then I've done my what I've been called to do."